Utøya is both a unique piece of nature, and the scene of one of the most horrific crimes in Norway’s history. The long history of Utøya shows to us an example of the continuous dependency between humans and the landscape. Within this duality, nature represents hope. In this nature, we as humans have cleared space to establish social communities and have made shelter to protect us from the weather. This cultural landscape is telling a story about how people and society have changed nature, and adapted to it through generations. In the period after the 22nd July 2011, there were big questions from a shocked world about the way in which this event would change Norwegian society. The high level of social trust and sense of community was challenged and even met with criticism. In light of this, we propose a landscape-friendly memorial, built through volunteer work and community – the true spirit of the Norwegian society. The long history of Utøya, tells us how a continuous dependency occurs between humans and the landscape. Our actions and traces are recognizable in nature. When a landscape and it’s people are faced with such a brutal and inhumane event as the one that took place on the 22nd of July 2011, the relationship between them is broken. All of a sudden, the gruesome actions of one man overshadow all other normal connections between these people and their surroundings. Where in other circumstances, one can read the spatial dimensions of a cultural landscape through the practice of normal behavior, the opposite is the case at Utøya. The beautiful characteristics of this space become a landscape of terror. Within this catastrophic paradigm-shift, it is important to focus on the fact that Utøya still is a piece of unique Norwegian nature – this space, in and of itself, does not have any memories of the tragedy. The essence of nature is that it can, through transformation, slowly erase all traces of the tragic events that happened here. With the changing of the seasons, as the waves wash away the shore, new growth can begin. The memorial at Utøya must, above all else, be a place that exposes these powers of nature; a power to renew and heal. The memorial at Utøya should show the nature that slowly changes time and the memories. The tragedy at Utøya calls for extra caution with regards to use of symbols. Our approach to this is that the place has to be designed in such an open manner, that it will benefit all types of people in their various stages of grief. Precisely because of this, we feel that the right way to start is to maintain our focus that Utøya is inherently a beautiful piece of nature. When a big tree in the forest dies, an organic process that creates what we know as a clearing begins – open room in the otherwise dense forest. We want to develop the memorial on Utøya as such a clearing; forming a clear spot and highlight all the beautiful landscape qualities that are already in place and in contact with the surrounding environment. Our goal is to shape the open space between the big pine trees as a major unifying circle. The circle is set in the landscape with a slightly lower slope than the current terrain, but still allowing the sloping down towards the water and preserves an amphitheater / bowl shape. When the path from the central building areas at Utøya comes in to the memorial, we lower the terrain gently along the circle, thus creating a seating edge where you approach the circle. On the opposite side of the circle, the terrain is slightly lifted and you create in this way another edge where you are facing out of the circle, towards the water and Sørbråten (public memorial on the shoreside). Along the edge of the circle, we pave the ground with rough slate-stones. This will allow people to move around, even in wheelchairs. The top and bottom edges are also covered with slate so they are more comfortable to sit on. Slate slabs will prevent that new vegetation and weeds grow too aggressive, therefore deteriorating the clearing. It will thus conserve the clearing without requiring extensive maintenance. Inside the circle we build a garden with specially selected plants that attract many species of butterflies found on Utøya. From the tall pine trees, we hang a heavy metal ring where the names of all victims are carved out. The names will read by the light that shines through the plate. Moving around the ring, one can read all the names. All building work is planned so that it can be performed with a high degree of volunteer effort. There are few requirements for precision, and the concept can be adapted to local terrain conditions on site. One of the most striking characteristics of the memorial is that by moving around, one can experience so many of the different qualities of Utøya – the characteristic pine forest in one place, the waves and water proximity at another place. The memorial’s slope and saucer shape also draws attention out towards the water, the horizon and the environment surrounding Utøya, also the national memorial on Sørbråten. In one way there is a relation between the memorial and all the various crime scenes for what happened on the 22nd July 2011. The memorial is deliberately located so that it does not have a site-specific history, very different from much of the rest of Utøya. No lives were lost at the site of the memorial on that day, and none of the dramatic events took place here. We might talk about the memorial as a kind of void to be filled with the individual’s needs to process grief, remember the lives that were lost and detach themselves from the drama that took place elsewhere on the island. When we visited Utøya this summer, we did a survey of various plants and trees. There are some particularly important conclusions that came out of this, and we have chosen to base our project proposal on these. cranberries and bilberries in the forest. After agriculture and grazing has ceased, there is eventually a powerful growth of plants belonging to the deciduous forests. This ecological transformation happens due to it’s nutritious soils and a favorable warm climate. Maple, lime, hazel, birch and other deciduous trees are about to take over the shrub layer with many of the herbs in the vegetation that characterizes our most lush and diverse forests. Such herbs are woodruff, goldenrod, mountain mint and forest viols. Eventually, the towering pine and some spruce will be left as the studs above the canopy of a rich forest that will cover most of the outlying areas of the island. This can also be seen specifically at the memorial today. It grows vigorously in both the clearing and around it. We believe that a number of the qualities that have been the basis for the selection of the memorial site, will deteriorate unless the clearing is maintained, and the pine forest preserved as the prominent vegetation type in this area. This will not happen unless specific measures are taken to avoid the emergence of deciduous trees here. If we transform the ground with stone on parts of the memorial, the spread of woodland is controlled, and the requirement for maintenance is reduced to a minimum. Simultaneously, development of deciduous forest in the east and west around the clearing, where nothing is done with the ground, will help to highlight the spatial feeling of the clearing even more. In the North, there is already a shallow soil-layer with poorer conditions of trees, so that the view of Tyrifjorden will always be there. Both the sunrise and sunset will be visible from the memorial in the summer. The tall pines and the lush foliage along the sides of the clearing will provide an open and uplifting sense of space – a natural sacred space. Throughout the ages, one of the society’s clearest social forms is to express ourselves in circles, for fellowship and protection. Especially in the face of nature, the circle is in many ways a basic social form. For example, the traditional Sami tent helps protect you from the elements and dangers, animals and enemies – all the while simultaneously preserving the fire to gather around. We all have a common universal recollection of gathering around the fire, gathering in a circle of song and dance, or gathering for reflection and contemplation. Between the large pine trees on the memorial, we propose to establish a great unifying circle. By moving around the circle, you experience the different characteristics of the nature on the spot, from the dense woods at the top, to openness, the views and the sound of the water at the bottom. 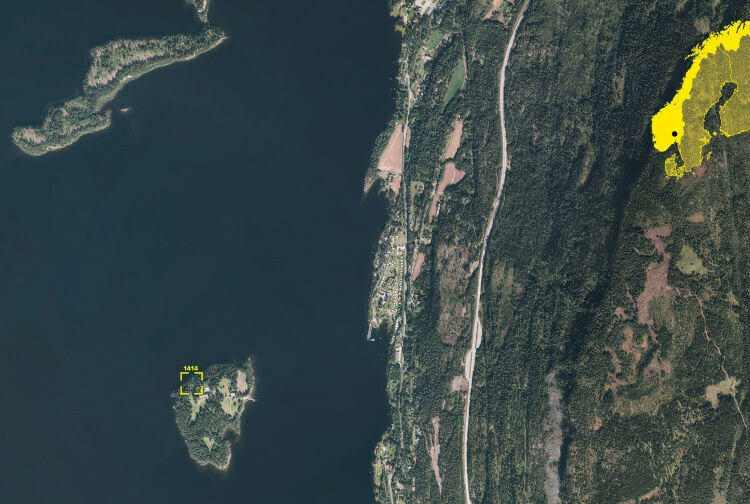 The circle provides a journey through many of the special properties Utøya has. The circle is established in a careful manner, using simple means. We adjust only the landscape inside the circle so that it has a somewhat lower slope than the surrounding terrain. We do this by digging out the top and lay on the bottom. This creates edges in some places along the circle of approx. 40-50 cm in the largest, top and bottom, and less along the sides. The edges will thus have a good height as sitting-edges. At the top of the trail from the central building area at Utøya, the circle is approx. 40-50 cm below the forestfloor around. The surface of the “cut” is reinforced with a steel plate, which quickly will get a patina that make it visually coherent with the other elements on site – but will provide a clear and readable edge. Light and shadow will also emphasize the shape in the terrain. At the lower part of the memorial, the circle will be higher than the surrounding terrain, and you will get a clear horizon where the circular surface is lifted off the ground. Also here the edge is reinforced with a steel plate, so you get a clear and readable brim with light and shadow. At the bottom you will be able to sit facing out of the circle, facing the view and the sunset. This part of the circle may allow withdrawing slightly, while the upper part of the circle facing inwards and will serve as gathering place that invites community. At the memorial, where the great unifying circle is established, the forest floor is dominate. There will be no other furniture or installations on the ground. On the forest floor, inside the circle, we make paths of slate to prevent growth of deciduous trees, but also to form a usable floor to walk on and to get to by wheelchair. The slates provide a smooth floor along the edge of the circle, but dissolve more toward the centre of the circle. The wear on the vegetation will then be divided between the stones and prevent overgrowth here, too. Along the edge outside the circle, we put slate so you can sit on a flat, stable surface. The stone surface can be rough, but it can also be treated in some locations to provide a smoother, glossier surface. Slate can be added without requiring too much preparation of the ground. This is suitable for volunteer work, it is very flexible and slate stones may be laid down in the most important places first, and built on further, if necessary. Just by facilitating volunteer efforts and the division of labor, we believe that it can add up to a good process, where the construction of the memorial can also be a part of grief processing, and provide a special relationship to the place of those involved. to make the place comfortable and warm for visitors, and also to attract the butterflies that search for such areas. The Clearing exposes nature’s ongoing transformation. Leaves and acorns falling in autumn are clearer on the stone floor than on the forest floor. We want to showcase as many as possible of the natural cycles that take place on the island. We believe there is solace and beauty in them. Nature has the ability to create logic in the life cycle, a logic that for most of us is hard to find when it touches our own lives. Therefore, we believe that all visual parts of these cycles and the activities that belong – be it sweeping of leaves or care of plants – are important elements of the memorial. The stone floor offers a venue for nature to reveal itself. To give victims’ names and ages a central and worthy place in the clearing, we suggest that these are cut out in a thick metal plate shaped like a ring. The ring is suspended from the large pine trees with wire cables, so that it hovers above the ground at eye level. The light will shine through the cutouts and make sure the names are visually unique. The names are spaces of light, sunshine, sky, plants and trees. When the sun shines through the cutouts, it will cast light and shadows on the ground. In the summer the sun will shine through each name during its path across the sky. When one walk along the outside of the ring, you can read one name after another as you move around. It would also be possible to step inside the ring and being enveloped by it. Then all the cutouts will be mirrored and stand united as the amount they represent, and not as much as the individual name. When looking upwards the ring will frame the clearing and the large canopy above. The ring will be able to move in harmony with the trees but very slowly due to the heavy weight. The ring is proposed to be made in stainless steel with a sandblasted surface. The ring will therefore not be like a mirror, but still reflect the colors and ambient light. In this way, the ring will absorb the unique character of the site through the day and throughout the year. The steel ring consists of smaller sections that are bolted together. The names are cut out on the sections in random order, with space surrounding. If it is necessary to add more names later, it can be accomplished by removing a section and transporting it to the workshop for the addition. We have studied various ways to connect the wires that hold the ring to the stems of the tall pine trees. It is a desired visual expression that the circle with the names do not touch the ground, but is suspended in the clearing airspace. To achieve a good mounting solution within this concept, it is very important that several factors are taken into account -first, the trees that bear the ring are not being damaged, and second, the ring itself must not pose any risk for those visiting the memorial. We have consulted groups that have extensive experience with this and designed fasteners in trunks that do not use bolts or screws, but that rely on a principle where small wooden blocks are clamped around the trunk with adjustable straps. In this way, the load is only on a few points in the bark around the stem and it does not destroy fluid movement upward in the tree. The fasteners are like a construction stiffener of a larger piece of the stem. The attachment point for the cables that hold the ring, is attached to this construction and not in the actual trunk. In this way, it does not make a strength weakening point on the stem, that could result in the breaking of the tree. The trees that will be used to hold the ring, will be carefully chosen in advance by arborists, so one can be sure that one chooses the trees that are best suited. Based on this expert assessment, there will also be considered whether it would be necessary to extend secondary cables from these trees to others to obtain extra stability. We have consulted with some experts who have used this method in the design of nature parks. In these examples there are both ideological perspectives about preserving the trees, and also a significant HSE and security focus that has led to such solutions. This coincides well with the considerations in this case. The trees that bear the ring will move in the wind. This will lead to some movement also in the ring. The ring will weigh just under half a ton and thus will not throw in the wind. To prevent uncontrollable, jerky movements, there will also be cables from the ring and straight down to the ground below where these are secured to a base slab hidden beneath the forest floor. In the transition between the foundation and the wire, there are placed springs, giving the ring the ability to move, but with a certain inertia. This principle is well known from among others mooring solutions for boats. Nymphalis antiopa is called in Norwegian Sørgekåpe, Sorgmantel in Swedish and in English Mourning Cloak. This is because the adult butterfly’s wings are similar to traditional mourning clothes. This butterfly in many places is perceived as a symbol of grief and transformation. This butterfly is also found in the Tyrifjord area. The varied and rich vegetation on Utøya gives a special ecological opportunity for the memorial. Twenty-six butterfly species can be observed along Tyrifjorden. Each butterfly has very specific requirements on which plant they lay eggs, and the caterpillar will grow. Host plants for all these different butterfly species are found on and around Utøya. When the caterpillar has eaten and is getting big enough, it will spend the winter in a pupa. In spring or summer the larva metamorphosis is completed and it is transformed into an adult butterfly, breaking out from the chrysalis. Adult butterflies find all their food and drink in nectar from flowers. The bushes and herbs that are planned for the memorial site contain flowers that attract the adult butterflies from all over the island. Many flowers grow naturally in forest clearings. Most of the plants we want to plant on the memorial are natural plants commonly found in this type of area. The plants are perennial and they do not need a lot of care and maintenance to survive. By creating the entrance to clearing wide, the north side of the clearing will get much sun during the main hours of the day, so the blooming becomes rich and nectar production high. Slate slabs on the ground will also retain heat during the evening, so that the clearing will be cozy and warm for visitors. A portion of the flowers that we will plant in the clearing are also host plants for some of the butterflies’ larvae. Rhamnus and Buckthorn are host plants for lemon butterfly larvae. It is thus so that when one sees a lemon butterfly, he can be sure that at least one of the two plants is growing nearby. In the sunny north part of the clearing, we want to plant flowering perennials and shrubs that attract butterflies. We have selected plants so that at least one of these is in bloom at any time during the summer. Furthermore, we have selected plants that bloom richly particularly midsummer. We have picked out several species known as rich nectar producers with deep flowers that butterflies with their long proboscis are attracted to, but that do not attract other insects, like bees and wasps. These are endemic species found naturally in forest edges and clearings; such as priest collar, goldenrod, melancholy thistle, lilac stonecrop, butterball, vervain and sallow. Daisies are already growing in the fields on the island, goldenrod is found in all sorts of forest, and thistles grow in forest edges and meadows. Melancholy thistle is, by the way, the only thistle which is not prickly. We will also plant garden plants that attract butterflies, including poppies, echinacea, calliopsis, asters and oil mint. In addition, we suggest planting several butterfly bushes – a fairly hardy species that has stronger attraction for adult butterflies than any other plant. Taking care of the butterfly nursery areas around the island, while creating ideal conditions for the adult butterflies on the memorial, helps to give the memorial a local and site-specific dimension. When butterflies appear on the memorial, one knows that it is because of something that happened somewhere else on the island. This will tie the memorial to the rest of the island in a subtle, organic and beautiful way. Our design ensures most of the work-operations on site would allow for a collaborative construction open to volunteer, the parents of the victim and former members of the youth labour party (AUF-veterans) – a process called in Norwegian a ‘‘Dugnad’’. The spirit of the Dugnad is embedded in the Norwegian culture, and is very prominent in the local culture in the youth labour party and on the island Utøya, both how it has been managed, and how it is run as a political venue. For us the spirit of Dugnad also can be a vital part of the healing process for those affected by the incidents in 2011. Through collective and active participation, one is able to produce new positive memories from the island, and form a special ownership to the memorial. Being able to participate in this work as an architect, side by side with the persons that the memorial is intended for, also gives us a very special relation to the project, more so than any other project we have designed.